Surge and Destroy is a 1-vs.-3 minigame in Mario Party 6. Its name is a pun on the phrase "Search and destroy". The three players are standing on one platform, with the single player on a platform above. The three players are then shocked as electrical streams emerge from the generators, along with the formation of a ball of electricity. The point of the game for the one player is knock out all the other three players with the ball of electricity created where the two streams of lightning intersect. 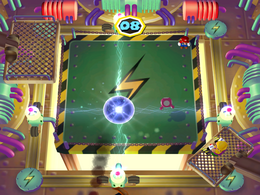 The other players must survive as the single player guides the sphere of electricity. If one of the three player is hit by one of the electrical streams, they are stunned for a second. If the single player wins, the player does his or her victory animation on the platform he or she stands on, while the others perform their losing animations on the other platform. If the three players win, they perform their victory animations from wherever they are. Rules – "Three players scramble to dodge a high-voltage electro-orb guided by a solo player." Advice – "Avoid the streams of electricity or you'll get stunned. Don't touch the electro-orb, or you're out!" This page was last edited on January 16, 2018, at 13:17.